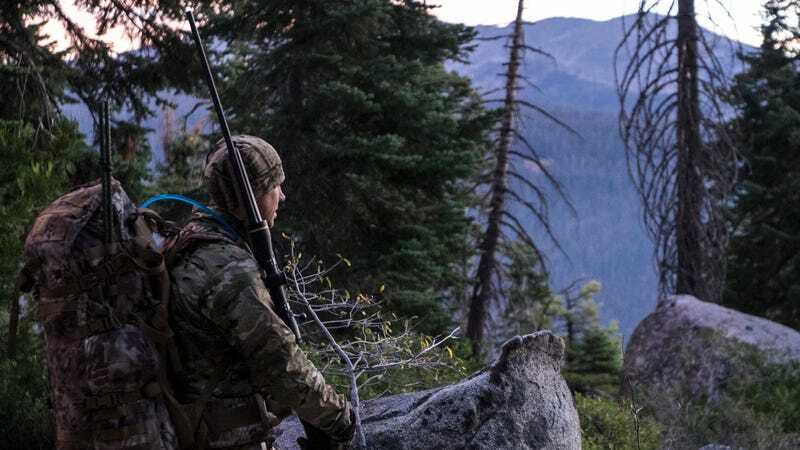 A week before the planned excursion, we ventured to the mountains with a few friends to dial the rifles in at the altitude we would be hunting and see the beauty the Eastern Sierra had to offer during fall. Both altitude and temperature affect how your gun will shoot so doing these adjustments in an environment as close to that you expect to hunt is best. I had first zero'ed my Weatherby Mark V in at 100 yards, but wanted to move that zero out to 200. A few well placed shots, adjustment to compensate, and we were in business. Stephen using the Slumberjack Rifle Hauler Mat that doubles as a shooting pad to sight in his rifle. At $85 it is a great padded rifle case that doubles as a shooting rest. Night 0 - After finishing up work and saying goodbye to the wives, my friend Stephen and I set out for the mountains 6 hours to the north. We arrived at the trailhead around 2:30 AM and promptly passed out for a few hours of sleep before getting ready at 5. Day 1 - We awoke cold to the crisp mountain air after a painfully short 2.5 hours of sleep. At 5 AM, the night time chill was still hovering around 35 degrees, thankfully the water in our packs had not yet frozen. We layered up with clothes, packed the packs, grabbed the rifles and hit the trail right before sunrise. We dropped down 1,500 feet to the San Joaquin river and stopped for breakfast. Stephen boiled water for our oatmeal while I kept my eyes pinned to the hills above. During the entirety of our trip, both Stephen and I had our binoculars strapped to our chest ready to spot the slightest of movement from a nearby animal. Once the belly was warm we clambered up the other side of the gorge and recovered that 1500 feet we had just descended. All along the trail were deer tracks and little poops. We knew that deer were in the area and it was only a matter of time before our game of hide and seek would end with a pack full of meat. At the next water crossing, we split up, Stephen followed the river to the North intending to catch another trail about 1.5 miles away while I quietly and slowly moved along the main trail heading for our first camp at around 8,500 feet. I had stripped off the Wild Things Gear Soft Shell jacket at this point as the temperature of the day was rising. I still had on a base layer and the powerstretch fleece hoody, a new favorite of mine. These were enough to keep me warm but dry while moving. We had hoped for a winter storm to blow through and blanket the area in a fresh layer of snow. It would have made the scenery even more amazing, but would have also pushed the deer down and out a little closer to us. When the snow really starts falling in a few weeks, the deer will all start migrating over the Eastern Sierras and out of the area we were hunting. Our first camp was a huge surprise with tree stump recliners, a wood slab table, a metal-clad tree for the bear bag, and ample area for tents. This was definitely a horse camp that was evident by the large corral in the nearby meadow. The Sierras hold a ton of history and it is really awesome to think about Cowboys and Indians trading in these very hills. We found signs of this evident by obsidian arrow heads. There is no natural source of obsidian to be found in this specific area for more than 20 miles. With an attached 2 car garage, the Big Agnes Super Scout UL2 does require some strategic campsite planning. Utilizing a pair or trekking poles and a plethora of guy wires over standard tent poles, this spacious mobile home of a tent weighs only 2.5 pounds! Stephen made it to camp a few hours later. It was the middle of the day and the deer were most likely bedded down by now, neither of us had spotted one yet. Squirrels seemed to be constantly taunting us by dropping acorns and snapping branches, a noise very similar to that of a deer walking through the forest. Our senses were maxed out ready to both see and hear anything that we could. Tent + sleeping pad + sleeping bag = 6 lbs. Nalgene for size comparison. Trekking poles weigh 10 oz for the pair. 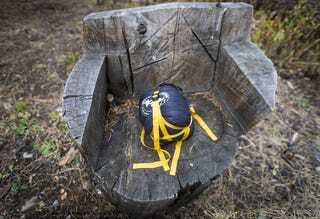 After spending a few minutes popping up the Big Agnes Super Scout UL2, inflating my Air Core SL sleeping pad, and laying out the Zirkel SL 20 sleeping bag, my pack was only 6 pounds lighter. My Helinox Passport Twist Lock poles were now held hostage with the tent, but since my pack was a little lighter after depositing most of my gear, I was ok with it. Following suit with the deer, we took an afternoon snoozer. Don't ask Wes about poles, he'll call you a sissy. For the same price as 80 chicken mcnuggets, ($18) and only 2 oz, the Girdle Compression straps can cut the packed size of your sleeping bag in half! Sunset came faster than we had expected and we worked our way out to the side of a hill that looked exposed on the map and we thought might also provide plenty of open area for glassing. We had the sun on our backs, illuminating the hill across the river. Stephen and I got comfortable and begin a slow, strategic, and methodical scan of the surrounding area looking for any sign of deer. With the temperatures dropping proportional to the sun, I was very thankful to have the LL Bean Hunter's Trail Model Fleece Hat and Technical Big Game Gloves keeping me warm. While LL Bean may not first strike you for your apparel needs, this gear did not disappoint. I tossed on the Wild Things Low loft jacket over the hoody and the insulation worked great. Holding your hands upright to keep the binoculars pasted to your eyes has a habit of draining all of the blood from your hands and instantly making them frozen meat popsicles. The mule deer that we were hunting in this part of central California have a near perfect natural camouflage. When stationary it is virtually impossible for the human eye to make out their shape against the decaying brown foliage of fall. Our hope at this point was to catch movement while they were feeding. Stephen caught sight of the first buck, but he was well over 1.5 miles away and making his way up a ridge. The sun was quickly fading and by the time we would have began to stalk him, shooting hours would have set with the sun. With the sun gone and the rest of the visible light disappearing, we headed back to camp for the first night. A few warm meals in the belly and stories from the day by the fire helped us stay cozy before jumping in for the night. I was eager to see how the Big Agnes pad and bag would do on this night. Plenty of room for two while sleeping, but shoulder room was a little cramped while we were both sitting up, getting ready slip in to our sleeping bags. We had expected the overnight low to be in the 30s and I was able to confirm that with my phone. I left it on throughout the night in airplane mode with basically nothing going on. The internal battery thermometer recorded the temperature all night and confirmed we saw a low of 33. I think I was pushing the limits of this uninsulated Air Core SL sleeping pad and would have much preferred to have had the insulated Q-Core SL, even for the extra 2 oz in weight. I woke up a few times in the night with shivers but was able to bundle up and get back to sleep. Being just shy of 4" thick meant that I was extremely comfortable! Side sleeping was amazing. The built in sleeve for the pad kept the bag and pad stuck together the whole night, no sliding off of this one. Because the temperature dipped so low and there were two of us in the single wall tent, there was some condensation on the inside in the morning. Nothing too major, but definitely some build up on the roof of the tent. Like the pad, I think this is about as cold as I would feel comfortable taking this tent. Our body heat warmed the inside of the tent up and the "garage" was noticeably colder once we opened the door. With all of the vents in the walls I think it would shine in the three seasons it is designed for. We were right on the bridge of the fall/ winter seasons. Thankfully the forest service had lifted fire restrictions in this part of California. With our fire permit in hand, we had no worries about freezing before bed. Something about a campfire just warms and encourages the soul at the end of a long day. Fire roasted bagels + honey and peanut butter...this is how dreams are made. Day 2 - We arose before the sun and set out back down the trail to a section that was littered with footprints, poops, and deer food. I posted up on the shoulder of small meadow and waited for the sun to come up while Stephen ventured a little further beyond the trail. I was super thankful this morning to have on all 3 of my Wild Things Gear layers. The wool base layer kept me warm and dry. The insulated jacket added much needed warmth, and the soft shell gave me snag free protection with more weather resistance and quite versatile camo. About an hour after the sun had climbed out from behind the mountains and still no sign of deer, I slowly and as quietly as possible made way towards an area that had burned in the past 10 years and was still recovering. The forest floor was littered with dead fall that made moving around quietly extremely difficult. About this time nature began to call...and while I was answering that call I was sure that I heard a deer meander by. I paged Stephen on the radio and got a crackle that he might be heading back to camp. I beat him back to camp and confirmed that it was either a squirrel scurrying through the trees and dropping acorns every 3 feet, or it was a deer, of which I will never know. Stephen also had a tag for bear, tracks like these told us that we were not alone. After a mid morning nap, we broke camp and headed north to the next higher camp, a lake sitting at 9,500 feet. The trail disappeared after about 500 feet and we were left bush whacking our way up the side of the mountain. Trusting my phone and the aerial imaging that Gaia GPS was relaying to me, we could see that there were a few meadows in the general direction of where we wanted to go. As a hunter, I hope and pray every day that I will see a beautiful buck chomping down in the middle of a meadow, but as Bambi's mother said it best, "you must never rush out in the meadow." Skip to 57 seconds in for mama's ironic advice. We skirted along the side of a few meadows and made our way up a ridge, stopping every now and then to glass opposing hill sides. After a short break we started moving again and Stephen in the most animated quietest whisper yell ever, mouthed "BUCKS!" Just beyond my line of sight of the crest of the ridge I could hear, but not see, the 2 animals get up and run away. We quickly and quietly chased them with the wind at our back, not ideal. They must have been snoozing in the mid morning sun. We sadly never saw the pair after this encounter but continued our way up to our next camp. A "dead lake" is one that has no drainage. We worked as a team and swept through a few more meadows but came up empty handed. Stephen would camp out high on the side of a hill in the shadow of a tree to further blend in while I slowly made my way up a small dry creek. Anything that I would spook, he would surely catch sight of. Nothing again. I made it up to the lake we would call home for the next 2 nights and pitched the tent. This thing is so easy to set up, even with just one person! Evening was upon us and after a long day of cutting our own trail, my body was getting tired. I scoped out a ridge that provided an expansive view of the valley below and set up for the sunset munch fest. I scanned each and every hillside in sight through my binoculars hoping to catch the subtle movement of a deer. About an hour after sunset, we rendezvoused back at camp. In this area of the Sierras, there was not too much above us, and due to the recent warm summer months, the lake showed signs of being extra low. There was no visible drainage from the lake which meant that we would need to be extra careful about purifying it. We relied on the tried and true boil method because it did not require us to carry any extra gear. Can you spot the deer tracks next to the lake? Day 3 - his would be our only day that would not involve moving camps and allowed us to spend the entire day on the hunt. We again awoke well before dawn and set out to post up over a few locations that provided plenty of coverage. Wind started howling early in the morning and I deployed the hidden hood of the Soft Shell Jacket. Clad in the same camo as the rest of the gear it kept the back of my neck warm. I spent about 2 hours in the same spot glassing the area and started to get stir crazy. There was another ridge about half a mile away and a good 500 feet above me. Curiosity got the best of me and I climbed up the "highway" as Stephen and I started to call it. The hillside was loaded with deer sign everywhere! Poops here, a bed there, and tracks all over the place. We knew that the deer had been in the area, but they just weren't here now. The hood hides inside of the collar until needed. Glassing in to the sun was difficult so I situated myself further to the north as to expose all of the south basin. A few more hours went by with still no moving animals. Around noon Stephen crackled over the radio that he had spotted a deer about 2 miles away and was in pursuit. He lost it in the dense woods and was heading back to camp. He would be walking through a few open areas so I positioned myself to scan whatever he might scare up. As he neared, I could hear something rustling in the bushes about 300 yards in front of me. Out of nowhere it breaks into a full sprint up the hill. I caught a short glimpse of it before raising my rifle, lowering the safety, and training the sights on it. Still sprinting straight up along what appeared to be a lush little creek, I finally caught a glimpse of the reddish/orange coyote! He looked like a coyote at first, but his coloring suggested a High Sierra Nevada Red Fox, one of the most endangered mammals in all of North America. Those little foxes don't weigh much more than a Min Pin, so his size gave away that this was definitely a coyote. My trigger finger was getting itchy like Jake Gylenhal in Jarhead and I wanted badly to shoot something. Coyotes are fair game in California but an endangered fox that has less than 50 in his species, that would have been a bad move. I would have put full confidence in the Weatherby Mark V to take him down if he had stopped his sprint from danger up the hill. The Danner Pronghorn 8" boots with Realtree Camo have the support needed to carry out a load. They are also layered with GoreTex for peace of mind while crossing through streams. Post coyote sighting, Stephen took a nap by a creek while I hiked north to get high above tree line and expand my view of the area to the west. We could see on the map that another little lake was less than a half of a mile away and I wanted to see if anything was over there. I clambered my way up a loose and deathly shale mountainside to reveal the smaller lake below us. As I started glassing I caught sight of something moving! Turned out to just be a pair of men and 2 horses. Stephen met me on the ridge and we had awesome views of the Yosemite valley off to the north. As the sun set on us for our final night we still had our hopes high of seeing something move. Once darkness had fallen and our stomachs were growling to be fed, we made our way back to camp to eat everything we could so we would not have to carry it home tomorrow. Nothing beats the High Sierra Sunset. Another 30 degree night in the Zirkel that I was able to sleep through. I know this bag will be supremely comfortable with a properly paired sleeping pad. Despite the lack of warmth from the pad, it was still extremely comfortable. Big Agnes has been leaving the down out of the bottom of the sleeping bag since day 1. They rely on the sleeping pad below you to give you the insulation needed from the cold ground. This allows all of the down in your bag to do its job of insulating and staying puffy. Day 4 - This morning was no different than the rest, rise before the sun, pack up and head out before the deer start moving. The trail we had blazed on the way up was seriously terrible. We could see on the aerial maps on our phones that another ridge less than ¼ of a mile to the west had a nice exposed face. This would make it not only easier to look out further, but also for walking in general. A few miles later and we were back on a trail! I had never been so excited to conform to something. We continued to keep our eyes and ears peeled for anything that might be moving in close proximity. A sharp crack of a branch breaking halted us dead in our tracks. We searched feverishly to spot what had made the noise. The scampering of a squirrel across a downed tree revealed that it was nothing to get excited about. We pressed on, stopped for an oatmeal break next to a river, then made our way back down to the bottom of the San Joaquin. We knew that this last climb to the truck would be the most brutal, nearly 1,500 of up on an exposed hillside. We spotted a few brook trout in the river and wished we had our fly rods. We downed the last of the snacks and set up the hill. We made it back to the truck after about an hour, slightly exhausted, a little bummed to not have a deer, but ecstatic on the adventure we did just have. Little did we know, the adventure was not over yet! An overhead lamp had drained my truck battery while we were gone. With only 1 other vehicle in the lot and no one around for 10 miles, we got crafty and borrowed some electricity, don't worry, no harm was done. On the drive down the mountain we were first responders to an overturned vehicle. Stephen broke out her window that she was trying to break with a key and helped her out while I grabbed the first aid kit. Amazingly she got away without a scratch! Someone she knew showed up on scene and we left to make the 6 hour drive home. Out of all of this, we learned that we are the 93%. The last item to the equation that may have been ruining our success was the moon. It was nearly full during this trip and that meant that the deer would be more active during the night, and less so during the day. If you go: You will first need a hunting license and a deer tag specific to the area that you want to hunt. Your local state Department of Fish and Game should have a wealth of information on areas, success rates, and costs. Where should you hunt? That is entirely up to you! I think the best place to hunt is a place that you have already hiked previously and seen the target prey. Or some place that your dad, uncle, friend, sister's boyfriend might know about and want to take you to. Venturing off into the woods without having been there first will likely result in an unsuccessful harvest, that is unless the place you are going is known to be severely overpopulated and the deer line up in meadows, if that's the case, have your pick. What you will need: Obviously, if you are hunting you will need a rifle, check out our article on how to do just that! I was expecting to carry out more than 60 pounds of meat and as I such, I needed gear that was light enough but strong enough for this task. Though I did not get to test the full weight carrying capacity of the Slumberjack Bounty 4500 pack, I feel confident that it would have been able to carry the load. The main pack portion is connected to the shoulder straps and frame through 3 cinch straps on either side. You can lengthen them and slide the pack away from your body leaving a nice space right near your back to load up your meat. The pack comes with a detachable day bag that I did not use but could prove handy on longer expeditions. It provides a few extra pockets to stash little items. The main pack is one big pouch that has a big flap that can zip almost all the way around the front and over the top. It makes it easy to access anything buried deep in the bag. The downside is that you have to undo the side cinch straps to open the side of the main flap. Clad in Kryptek camo, the bag has a way of disappearing with its surroundings. A detachable day bag that I did not find a need for on this 4 day trek. A vestibule that is twice as big as the tent space! Being that this was a backpacking trip first, while carrying hunting gear, we needed all of the normal backpacking gear to get us out there. The Big Agnes tent, sleeping pad, sleeping bag, and hiking poles all worked awesome. I am ready to push rely on this gear for years to come. I can't say enough good things about the poles. At 10 oz (yes, for the pair), they are probably the lightest pair of poles available. I have well over 100 miles on this pair and that includes arresting my fall, hiking through snow and ice, and even using them for odd jobs. Many uses for the hiking poles...make shift tripod! We had been expecting snow leading up to the trip and there were a few items that I had to cut from the pack before heading out. The last layer to the Wild Things Gear outfit is the Hard Shell Jacket and Hard Shell Pants. These both come in the same multicam pattern as the rest of the kit and provide the ultimate in piss poor weather protection. They utilize 3-layers of eVent fabric (my personal preference over GoreTex). If you have not yet seen a comparison video of breathability of eVent vs Gore Tex, you need to watch this. The downside to a hardshell setup is the noise. While wearing these, I think opening a bag of Fritos would have made less noise. That is a huge disadvantage when you are trying to hunt quietly and, frankly, would not cut it for hunting. All of the Wild Things Gear is made in America for our nation's military. It is extremely well made and built to last. Lastly, I had a pair of Outdoor Research Crocodile Gaiters waiting and ready to keep snow out of my boots. I am looking forward to more heavy weather this winter to put these products through the wringer.